International Olympic Committee President Thomas Bach on Monday hosted a group of students from northeastern Japan to discuss the region's recovery from the March 2011 earthquake and tsunami disaster, as well as preparations for the 2020 Tokyo Games. 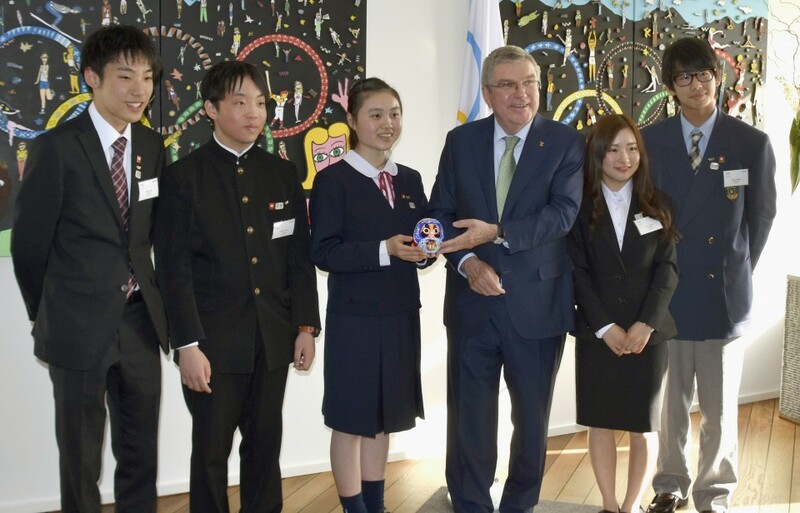 The five teenage "reconstruction ambassadors" from Iwate, Miyagi and Fukushima prefectures in the Tohoku region told the IOC chief about the current situation in the area and the role of sports in its revitalization. One of the students, 14-year-old Keitaro Takano, has been campaigning to repair the image of agricultural products from Fukushima Prefecture. Their reputation has been affected by the nuclear crisis stemming from the earthquake and tsunami disaster. "The Olympics have attracted attention from all over the world. Mr. Bach has given us his backing, so hopefully we can gain even more support," Takano said. As Fukushima is set to host baseball and softball at the Olympics, Bach invited the youngsters to attend a game together with him. Bach said he was impressed by the work that the ambassadors had done in their communities, and was extending the invitation as a sign of his appreciation. Olympics: Tokyo 2020 gets cherry blossom design in torch of "hope"